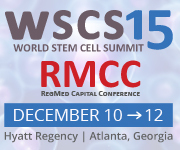 I’m excited to be attending the World Stem Cell Summit starting today in Atlanta. This is a novel meeting that brings together academics, industry, patients, and more stakeholders in the stem cell and regenerative medicine world. Sounds good. Hopefully you’ll have a change to talk to Lee Buckler. He just arrived there today. Paul – many thanks for the video stream – good stuff – wish more sessions were streamed, but I guess they’ll all be up after the summit finishes.